Our Manhattan health centers are listed below. You can also view a list of our partner pharmacies in Manhattan. 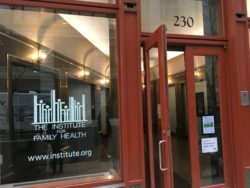 The Institute also offers school-based health services in Manhattan. Visit our school health page for more information. Take 1,2,3, A,C or E to 14th Street. Walk to 230 West 17th Street (between 7th & 8th Avenues). Take 2, 3, 6 to 116th Street OR take 4, 5 to 125th Street. Walk to 119th Street and Madison Avenue. Take 1, 2, 3, B, C to 96th Street. Walk to 690 Amsterdam Avenue (between 93rd and 94th Streets). Take the B, D, M, V or N, Q, R to 34th Street – Herald Square. Walk north on Sixth Avenue and East on 35th Street. The center is on 35th Street between Fifth and Sixth Avenues.